Lencrow Group announces the availability of a new range of mini power pallet trucks designed for larger capacity. Manufactured by EP Equipment, the 1800kg mini power pallet trucks from Lencrow Materials Handling are designed to work in the back of delivery trucks. Featuring a low self-weight of only 280kg, the unit has a boosted drive unit that gives better traction on ramps and tailgate loaders. 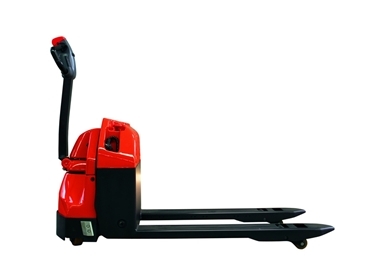 New features also include greater stability with better designed casters and inbuilt battery charger. Ross Grassick, Lencrow’s general manager explains that the new EPT20-18ET mini power pallet trucks have been specifically designed by EP engineers in response to a requirement from the beverage delivery sector, which sought a larger capacity unit with low self-weight. Lencrow has been selling the 1500kg version of this unit for some time, and the pallet truck has impressed users with its reliability in many applications. Both models are available from Lencrow to meet specific customer requirements. The EPT20-18ET mini power pallet trucks are built using some of the best components sourced from manufacturers worldwide. Available through the EP Equipment worldwide network, the units are designed to suit market requirements. For instance, in the case of Australia, the pallet trucks have been built to work with hardwood pallets featuring 25mm bottom boards.